As the remnants of an Epilepsy Walk cleared out, Flavet Field became an empty plane of grass and dirt. Dust clouds flurried, rustling the browning vegetation. The field would have remained empty, if it weren’t for the singular white van parked towards its center. Gainesville resident Hao Wang emerged from the vehicle, carrying a cubical black and silver box. Ushering the speaker to the stage, he set it to blast songs from Disney films at a volume that could be heard across the entire field. Coach Tim Derrick helps his team set up for the Swamp Cup. This event consisted of multiple scrimmage games and educational lessons for new players. 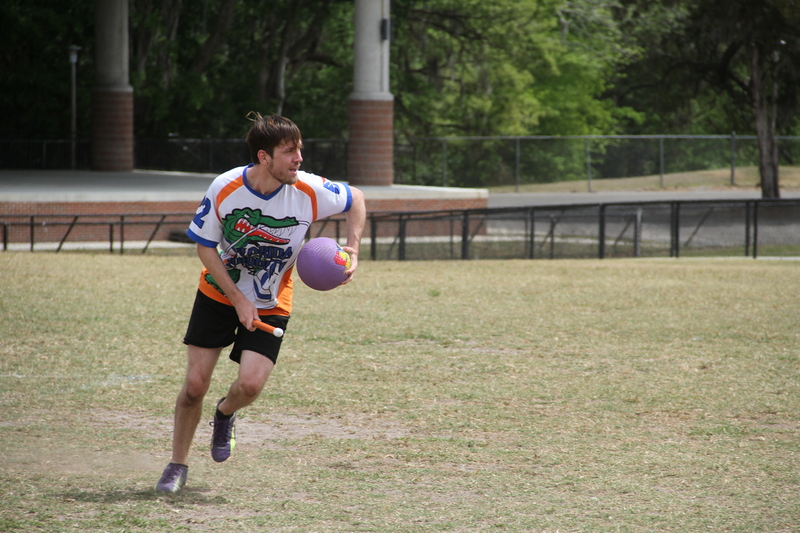 Saturday was the 2017 Swamp Cup, an effort to attract players and spectators from across Alachua County, regardless of experience in the sport. This wasn’t a baseball outing, football game, or a soccer tournament. 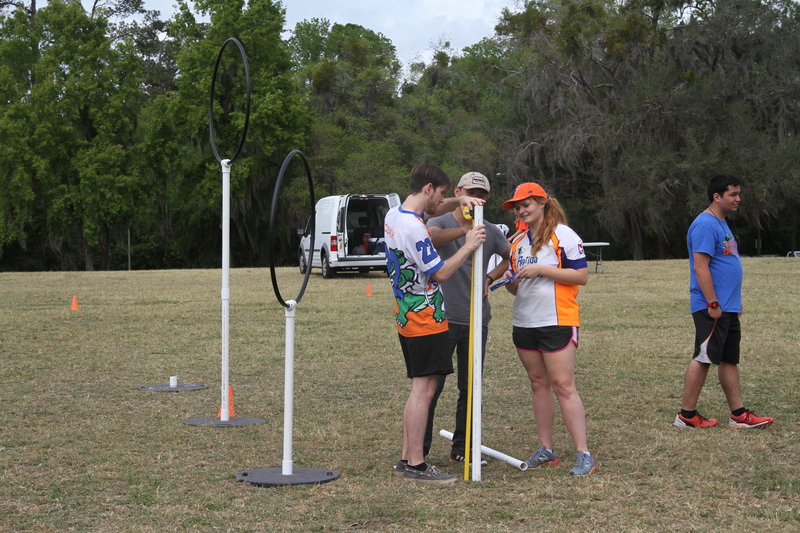 Hosted by the University of Florida’s Quidditch team, residents of the county gathered to bring the fictional sport from the Harry Potter book series to life. Team members assist new players with a warm-up exercise. These players are being taught mechanics that apply to playing a legitimate Quidditch match. “We’re very accepting that you don’t know how to play, this is not a sport people grow up playing,” said Gainesville resident Meg Cannan. She has been a member of the team since August 2016. Tim Derrick, the six-year coach of the team, said he saw this event as not just a casual set of scrimmages between teammates. There are two nights a week already reserved for that. This was an attempt to attract new players, the start of a plan to resurrect a team that Derrick said had split over the past year. Coach Tim Derrick joins his team members in a Quidditch match. He plays himself to help teach new players by example. 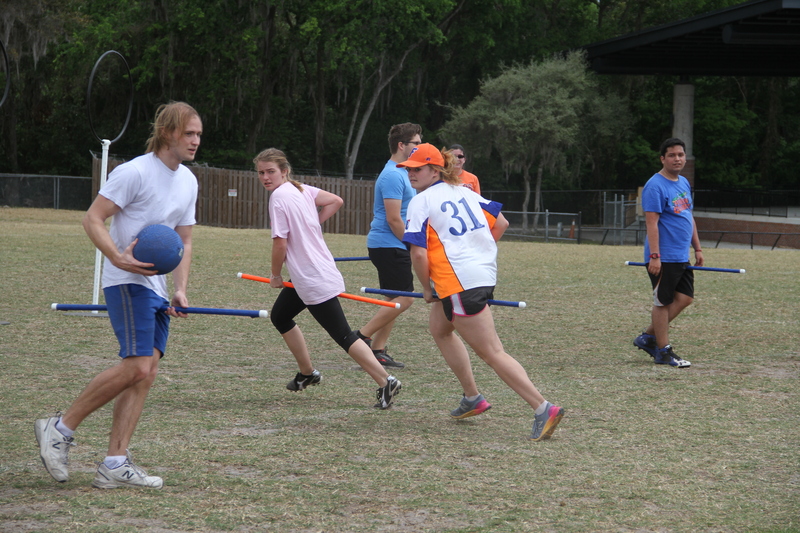 Cannan said the UF Quidditch team used to be the second best in the region. One of the factors that makes Quidditch stand out from traditional sports is that college teams and community teams play in the same league. She said this led Florida’s Finest, a team dedicated to conglomerating the most skilled players from across the state, to recruit the strongest players from Florida universities. “UF’s team was a victim to this system, and because of that we are struggling with membership,” she said. Choosing to temporarily drop out from the official United States league, Derrick said he spent the year trying to reinvigorate the team, attracting new members to come play through weekday scrimmages and events such as this. 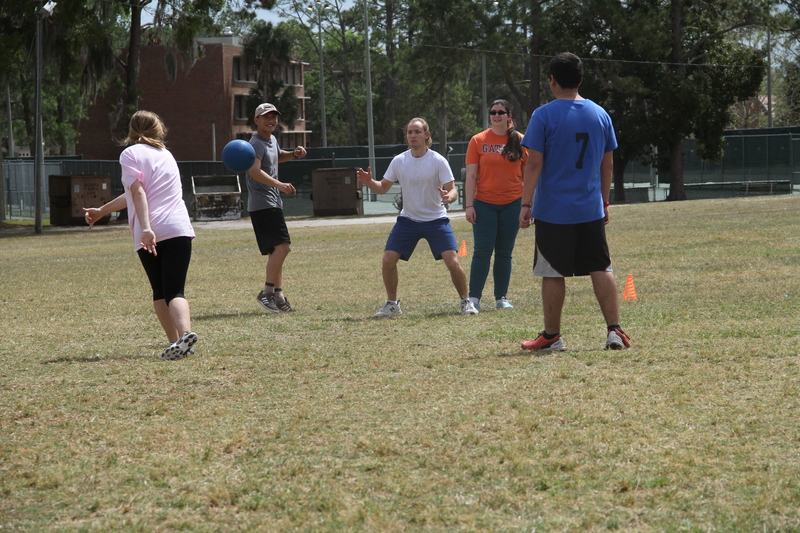 Team members and new players engage in a game of Quidditch. Each player carries an orange or blue “broom,” representing the team they are on. Derrick said a major dilemma of coaching a sport that originated from fiction is the variety in player skill levels. As he allows anyone interested to join his team, he said he receives people who run the gamut of athletic ability. It is this struggle that Derrick said motivates him to revitalize his team. “It’s rewarding when they finally figure something out,” he said. Coach Tim Derrick advises new players. Newcomers were placed on teams with experienced members so they would learn through play. 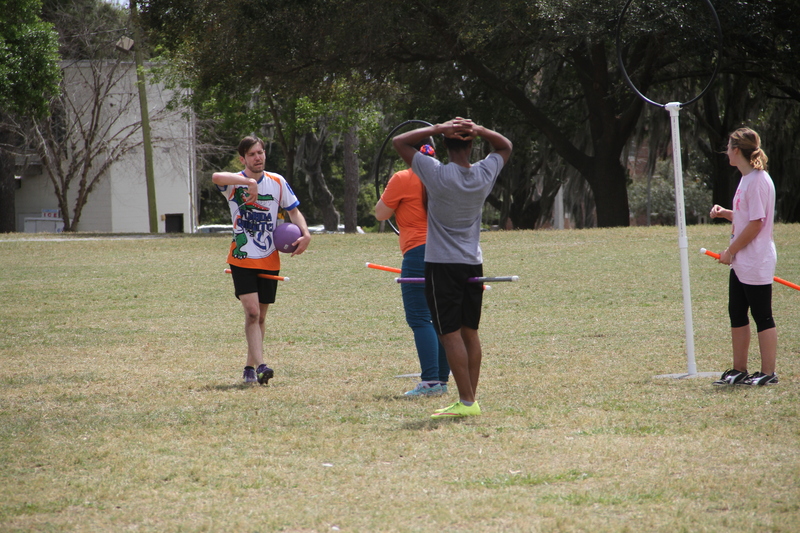 Derrick said the decline of the Harry Potter mania has changed Quidditch in Gainesville for the better. “Non Harry Potter fans have started seeing it as a sport,” he said. He said this change in perspective has allowed for people who have never read a J.K. Rowling novel, or seen a single film in the saga, to become immersed in the game. Meg Cannan struggles to keep hold of the ball. 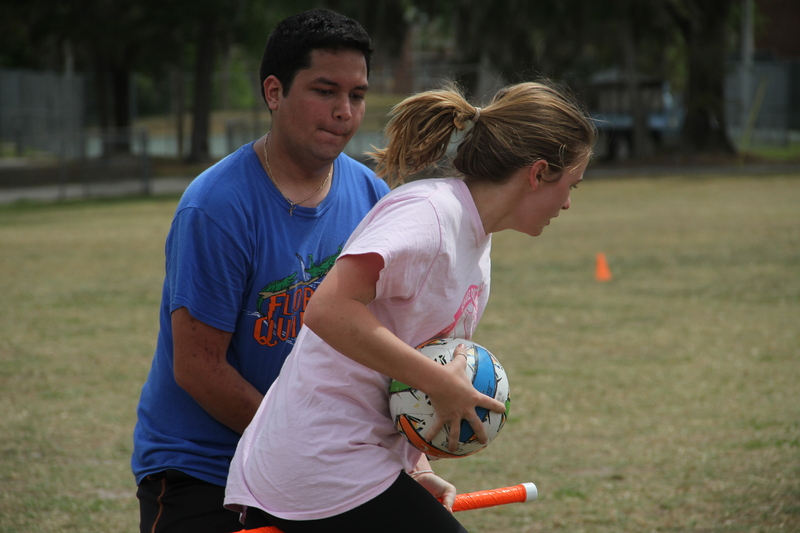 Quidditch is a co-ed sport, despite being full-contact. Cannan said it was the friendliness and sense of community that convinced her to join the team, and believes that is what will attract others. I remember I played This and it’s more tiring than I expected. But super fun. It should become a more active sport for people.